Coming up this Wednesday we have a public physics talk at the University of Surrey as part of the longstanding series of local Institute of Physics Branch talks that have been organised at the Uni. This week we welcome Dr Chris Hooley from St. Andrews University, who is coming to talk about this history of atomic theory and how it has led from the philosophical speculations of ancient Greece to today’s scientific understanding of how all matter is constituted. I am looking forward to Chris’s visit. Not least for his talk, but also because we have worked together a bit in the past on the links between the sort of theoretical nuclear physics that I do and the solid state systems that he is interested in. He is also an old friend. We were at the same university together as undergraduates and PhD students, and shared a house for a year. This is one of the nice things about life in academia; though we have ended up at far sides of the country, we carry on working together and meeting up every now and then to discuss physics, and old times. 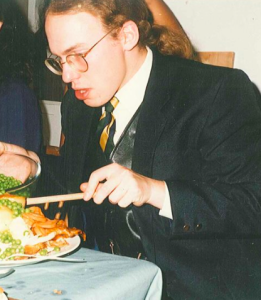 The picture in this post shows one of those old times – Christmas dinner in the year we lived together in Oxford. Details of the talk are here (facebook) or here (IoP).